What Is Capresso Coffee Maker? Does your coffee maker has brew strength control features? Do you need automatic shut-off? Does the coffee maker offer water temperature settings? What about the brewing time? What comes after the coffee grind? A coffee maker can make or break your brew and your mornings. If you want your coffee to taste like a beautiful sip from heaven, then choose a Capresso coffee maker. Investing in a good coffee machine is always a wise choice. A strong, quality cup of brew not only increases a coffee drinker's quality of life but also boosts your sagging energy levels. Tennis legend Serena Williams was feeling a little sluggish in her match with opponent Flavia Pennetta. After losing her first set, she decided she wanted a little pick-me-up. When you’re Serena Williams, you have to get some perks right? She ordered a shot of espresso to wake up her senses. The high point of the story is Williams went on to beat Flavia 0-6, 6-3, 6-0. Later she jokingly called the beverage her miracle coffee. And let's face it -- she's right in a sense. Capresso mixes the terms cappuccino and espresso to produce something new in the world of coffee. 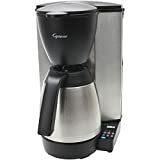 With a wide selection of choices including- cup to carafe coffee and tea maker, bean to carafe coffee makers, personal coffee makers, and drip coffee makers, Capresso leads in coffee innovation. Founded in 1994 Capresso introduced high-end Eurostyle coffee makers to the American consumer. Later, Capresso entered into a joint venture with Jura AG of Switzerland which then became the sole owner of all U.S Capresso and Jura Capresso operations. Not only does your coffee maker gives a freshly prepared hot cup of coffee but also makes iced teas, hot chocolate, iced coffee, and even Chaider a new recipe exclusive to Capresso coffee maker machines. Some of the famous recipes commonly used with the Capresso coffee maker include orange pomegranate iced tea, peanut butter hot chocolate, watermelon lemon iced tea, lavender iced tea and pumpkin spice hot chocolate. Also, try these delicious cold milk frother recipes New York egg cream, Rhode Island frothed coffee milk, iced Kahlua cappuccino, and lemon chiffon latte. Coffee making is an art where the use of the correct quantity of coffee beans and proper brewing techniques gives you a delicious cup of coffee. Coffee beans contain more than 1000 flavor and aroma compounds. The most aromatic and best-tasting compounds get released when brewed at temperatures (between 195 and 205 degrees). Coffee machines usually depend upon your lifestyle or the type of coffee you like. According to brewing techniques the coffee makers are classified as follows. Brewing espresso is much more popular in Europe than it is in the US. There are a few disadvantages to espresso machines. Generally, they take a lot more work to use and clean. Moreover, they are often more expensive than instant coffee makers widely available in the US. If you’ve brewed and tasted a great espresso, you may not like all the other types of coffee. Moka pots technically don’t make espresso because they use lower pressure while real espresso machines use more. But the coffee you get from Moka pots is usually strong. Some Moka pots will even produce a bit of cream just like the high-end espresso machines. If you want to make cappuccinos or lattes at home, you’ll be more than satisfied with the results you get from a stovetop espresso machine. They are perhaps the most common kind of coffee makers in large households and offices. The drip coffee makers are extremely easy to use and brew a whole pot of coffee rather than just one cup at a time. But the only concern is that it takes more time to brew. These coffee makers have a cylindrical beaker with a lid and a plunger attached. To prepare coffee, you must put in the coffee grounds, then wait for a few moments before using the plunger to push them to the bottom. The French press coffee makers are difficult to clean, and the grounds often leak and end up in your coffee mug. Pour-over coffee makers are old fashioned and manual. You put a ceramic mesh over your cup, fit in a filter paper, add coffee and pour boiling water over the coffee grounds. The decoction filters and drips into your mug. These machines are easy to use. When you put the pod with coffee into your machines, it automatically prepares your coffee. Instant pod-based coffee makers have risen in popularity over the recent years and are quite affordable. Iced coffee tastes better when it’s cold brewed rather than prepared in the typical fashion. Brewing cold coffee produces sweet flavors which results in a less bitter and more concentrated coffee that’s usually iced and topped with milk. Coffee plays a vital role in everyone’s daily life, and that raises the need of having a coffee maker. Drinking coffee not only boosts your energy levels but also has certain health benefits. It helps to burn fat, lowers the risk of type 2 diabetes, and might protect you from Alzheimer’s and Parkinson’s disease, boosts liver health and fights depression. Don't believe us? Just talk to your doctor! The East Coast Blend and West Coast Blend are the two varieties of coffee beans that are available from Capresso. They cost between $10 to $20. There are many coffee makers available on the market. To find the best coffee maker that suits your needs, you must consider certain factors before going in for the final buy. As we’ve already seen, there are different versions of coffee makers. Be specific about your requirements, try different models, and choose the one that best suits your needs. The next factor to consider while purchasing a coffee maker is the capacity. Check the water capacity it can hold and how many cups it can make at a time. The pod machines are great for brewing a single cup of coffee. Many machines can make 12 cups in one go and some less. Knowing the capacity will help you to get the best buy. There are different coffee makers to choose from. However, the cost plays a critical role in deciding the options. Single-serve machines, espresso machines, and fresh press coffee maker often fall in the price range below 100 dollars. Bean to cup machines and high-grade espresso machines fall in the above $150 categories. They have some high-tech features such as self-cleaning, and water filtration. It’s crucial that you have control over your caffeine intake. Modern coffee makers come with multi-function settings that makes either a strong or subtler coffee. Knowing which coffee maker has this option will help you choose the best one within your budget. Nowadays most of the coffee maker machines come with auto shut-off. This feature reduces your energy cost and increases the durability factor of your coffee machine. Grinding coffee beans before the brewing process gives a great taste to your coffee. If you have limited kitchen space, buy a coffee maker with a built-in coffee grinder. Alternatively buying a separate grinder is an excellent way to go. The thermal carafe is a temperature-controlled coffee pot which keeps your coffee piping hot long after brewing. Usually, thermal carafes are stainless steel. Alternatively, you can buy glass carafes that have better visibility and are dishwasher safe. Water temperature settings are equally important as that of brew strength settings. Standard temperature control varies from low to high, while more advanced coffee makers have specific temperatures such as 150 to 210 degrees Fahrenheit. Next to temperature and brewing strength, brewing time is what makes your coffee taste so great. Ensuring that your coffee maker has the right brewing time settings will maintain the freshness and flavor of the grind for as long as possible. Matching the perfect coffee grind to your coffee maker results in a flavorful and delicious shot of coffee. For a French press coffee maker, a coarse grind setting is correct, while for a drip coffee maker somewhere between a medium to medium-coarse grain is essential. Alternatively, for an espresso machine, an extra-fine grind is a perfect choice. Similar to a French press, a single-serve coffee maker requires a medium to fine-grind coffee beans. Cleaning your coffee maker on a regular basis will keep it in an excellent working condition and improve your coffee’s flavor and freshness. Accumulation of leftover coffee oils inside the coffee maker will result in coffee that tastes rotten or spoiled. If you use tap water instead of distilled water, it will lead to the formation of limescale and mineral deposits. To prevent all these happenings clean the inside of your coffee maker monthly once with a vinegar and water cleaning solution. Vinegar will remove the stains, coffee oils, and limescale deposits. Alternatively, you can replace vinegar with dishwashing liquid or use specialized cleaning solutions to clean your Capresso coffee maker. 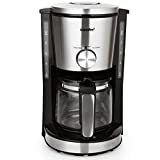 To remove coffee oil and residue soak and clean the removable parts of your coffee maker in 50 percent hot water and 50 percent white vinegar for one hour. Use a toothbrush and baking soda to clean the crevices that are difficult to reach. Canned air helps to remove the dust particles in your coffee maker’s heating elements. Replace any damaged parts immediately to increase the life of your coffee maker. You can shop for Capresso coffee maker online directly from the manufacturer. Amazon, eBay, and Walmart are the other best sources. Some stores in your area will also carry a Capresso coffee maker. If you prefer, you can see one in person and get a real feel of the product. Finding brewers that makes a great tasting fresh pot of coffee without much fuss is a Herculean task. We’ve made it simple for you by reviewing some of the best models of Capresso coffee makers. We took into account the type of coffee maker, capacity, ease of use, special features like auto start, auto shut off, auto clean and water level indicator and finally the speed and brewing temperature. One Amazon customer points out that she had bought several Capresso products before and never had a disappointing experience. Many others share her sentiments. Capresso coffee makers are a trusted ally in millions of American homes, silently energizing each day with a strong cup of coffee. Not only does this Capresso coffee maker look stunning, but it also quickly brews five cups of coffee. The glass carafe features a drip-free pouring spout, ergonomic handle, and a brew-through lid. This coffee maker has an easy-to-clean permanent filter which eliminates the need for paper filters. The programmable clock allows you to pre-set a brewing time, so you don’t have to make coffee bleary-eyed in the morning before work. Also, you can quickly check the water level with an internal water level indicator which displays one to five cup markings. It’s an excellent coffee maker, brews a great pot, the coffee is hot, and the carafe pours perfectly quips one excited reviewer. This mini Capresso coffee maker scores 4.5 out of 5 Amazon stars and is pocket-friendly. The Capresso Jura coffee maker features high-quality heating elements that heat the water to ideal brewing temperature of 200-degree Fahrenheit. As a result, you get the coffee in less than one minute per cup. The brewing is so perfect that your coffee is never bitter. This coffee maker has a unique stainless steel heating system which eliminates water contact with Aluminium to reduce the need for decalcifying. This coffee maker shuts off automatically, so you don’t have to worry about it burning hot all day long. Also, it contains a reusable GoldTone filter that’s easy to clean. The Capresso Jura coffee maker always makes good coffee which stays hotter. Highly recommended writes a satisfied Amazon customer. The Capresso Jura coffee maker scores 5 out of 5 stars. This Capresso coffee maker bags the Amazon's choice title and also scores a decent 4 out of 5 stars. This coffee machine comes in a stainless steel housing with fingerprint-proof finishing. It has a two-hour safety shut off and also features a reusable GoldTone filter. Also, there is an electronic filter indicator alert which prompts you to change the charcoal water filter. Glass carafe with a drip-free pouring spout, brew-through lid, and ergonomic handle. Amazon customers are pretty satisfied with this Capresso coffee maker. This one is perfect in every way beams one reviewer. Capresso is a brand that has mastered the art of coffee making. Their coffeemakers are top-of-the-line and use durable materials such as stainless steel when creating the machinery. Capresso as a brand is pretty hard to outdo. Let’s take a look at some of their potential competition. This Cuisinart coffee maker is fully automatic with 24-hour programmability. It has brew strength control, which allows you to select regular or bold coffee flavor. Also, it has an adjustable keep warm temperature control and auto-shutoff. This machine comes with a superior technology that ensures hotter coffee without sacrificing on flavor or quality. The customers love it and give 4 out of 5 stars on Amazon. Barun drip coffee maker comes with a pure flavor technology. It ensures your coffee is made at a right temperature with perfect brewing time to give you the best coffee flavor and aroma. The programmable timer helps you to wake up each day to a fresh pot of coffee. This machine contains a brew Pause system which allows you to pour a cup anytime during the brew cycle. A unique water level indicator, easy access control, gold-tone filter, and a small and sleek design are its other special features. This coffee maker gets a decent 4 out of 5-star rating from Amazon customers. 【Large Capacity 10-cup/1.25L Coffee Carafe and keep warm function】 with 10 cup/1.25L large capacity, suitable for family and office. And the keep warm function ensures you can always enjoy warm coffee. 【Easy Cleaning with Detachable Parts】- With Removable filter basket and funnel, cleaning process is fast and easy. The glass coffee carafe is dishwasher safe. 【Keep Hot Carafe Base Plate】- The electric keep warm function and the carafe base plate ensure your coffee stay warm constanly. 【 3 in 1 Coffee Strength control Knob 】It includes 3 levels of the coffee strength: classic brew, rich brew and pre-infusion, which provides light, middle and strong coffee flavour for you. 【Lighted On/Off Switch with View-able Water Window】- Simple on/off button and easy control. Dual water window on the sides allows visibility as you filling water-no more overflows. It’s a large capacity coffee maker suitable for family and office. Moreover, the keep warm function helps you to enjoy warm coffee all through the day. Also, this Comfee electric coffee maker has a three-in-one coffee strength control knob. You can choose from three settings, including classic brew, and rich brew. This equipment consists of a viewable water window which prevents overflows. The keep-hot carafe base ensures that your coffee stays warm constantly. This electric coffee maker bags the Amazon’s choice title and is very affordable. An Amazon reviewer says that he just loves the product because it’s so clean, comfortable to use and inexpensive. If you’re looking for an excellent coffee experience, then the Capresso programmable coffee maker with glass carafe is your best bet. The design of this coffee maker is absolutely beautiful, and it will fit right at home among other stainless steel appliances. 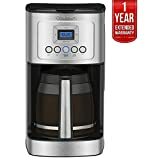 This coffee maker has high-quality heating elements that heat water to an ideal brewing temperature of over 200 degrees Fahrenheit to give you the freshest and most flavorful cup of coffee. Capresso programmable coffee maker bags the "Amazon’s Choice" title and has many high tech features. Above all, it is available an affordable price range. What more could you ask for? Previous articleIs the Best Coffee Grinder a Blade or Burr?